Admired by some as strong and loyal, vilified by others as vicious killers, and cherished by many as sweet family members, pit bull type dogs inhabit extreme and contradicting places in the American imagination. For decades public debate has raged over the nature of pit bulls and their rightful place in communities (“pit bull” is not the name of a specific breed but rather refers to few breeds and mixes, notably the American Pit Bull Terrier and American Staffordshire Terrier). Since pit bulls began to be imagined as inherently dangerous in the 1980s they have been the subjects of wave after wave of negative media representation. Municipalities across the country implemented breed-based regulations and bans, resulting in countless dogs being surrendered to shelters or seized and euthanized. In recent years rescue and advocacy efforts emerged in response, with a shift toward positive representation and public education to debunk myths and promote responsible pit bull ownership. While it has been assessed that things are looking up for pit bulls (Greenwood, 2014), pit bulls are still used in dog fighting, and they represent the most abused, abandoned, and euthanized dogs in the country. Negative media representation and popular fear about their physicality and temperament persist and contribute to these problems. From a depth psychological perspective it is clear that challenges involving pit bulls have more to do with the way they are imagined than about the dogs themselves. My study of the cultural and psychological dynamics surrounding pit bulls began with the adoption of our dog Fraia, and finding homes for her eight newborn puppies. While reading online media to educate myself about pit bulls my attention was drawn to the projections onto pit bulls and people associated with them, as well as the emotional intensities that infuse the fields they inhabit, which hint at strong archetypal contents at work. Uprooting the causes of the problems involving pit bulls requires psychological work on a larger cultural level: to withdraw projections from pit bulls and to work through the archetypal contents that are activated. Hillman (1975) said: “There is no place without Gods and no activity that does not enact them. Every fantasy, every experience has its archetypal reason. There is nothing that does not belong to one God or another” (pp. 168-169). Holding Hillman’s point in mind, I turned to my curiosity about the archetypal activity underlying pit bull phenomena and opened my imagination to the complexes and Gods at work in these phenomena. The archetypal being that appeared in my imagination is Cerberus, the three-headed canine guardian of the underworld. In Greek mythology the underworld is the land of the dead, called Hades. Depth psychology regards the underworld as that part of psyche that houses the darker, shadowy aspects of the unconscious, what is rejected, unknown, mysterious, frightening. It is a kind of land of the dead, because ego death must occur in order to enter it. We enter the underworld, a kind of liminal space, through practices like ritual, psychotherapy, shamanic experiences, art, active imagination, and emotional states that shake our normal consciousness, like grief, fear and remorse. The underworld can tear us apart, but it is in falling apart that our souls experience renewal (Hillman, 1975). The Cerberus in my imagination guards the collective American underworld, a realm that our soul-anemic, ego-focused and progress-oriented society tends to avoid. Projection is one way in which we defend against the anxiety of entering the psychic underworld. Therefore, the canine guardian of our underworld looks like the dog who holds the most American projections: the pit bull. Each pit bull head of American Cerberus has a distinct expression according to the specific archetypal content projected onto pit bulls. They are: Warrior, Monster and Angel. Depth psychologies recognize projections as outward manifestations of complexes: those structures in the unconscious made of an archetypal core and surrounded by cultural and personal contents. When split off from consciousness complexes become autonomous, gain in mythic numinosity, and may lead to “insane collective projections upon other people, whole races and nations” (Hillman, 1975, p. 33). In the case of pit bulls we can add “breed” to this list, as projected complexes have launched pit bulls into mythic realms as near-supernatural beings rather than ordinary dogs. When confronted, made conscious and integrated, complexes lead to psychological growth and healing (Jacobi, 1959). Working through the complexes projected onto pit bulls would on the one hand serve to reduce the dogs’ unnecessary suffering, and on the other foster cultural healing, particularly through promoting responsibility for our own aggression instincts and unconscious shadows. The first step is to examine the histories, cultural contexts and the consequences of the projections of Warrior, Monster and Angel Pit Bull. Warrior Pit Bull has ancestry in working and fighting dogs that dates as far back as ancient Rome (Hearne, 1991; Robinson, 2011). He travelled through war and conquest into the British Isles, where he was used in livestock work and blood sport entertainment of bull and bear baiting. His form was honed through breeding bull dogs with terriers, and his fighting activity shifted to dog-on-dog fighting when the blood sports became outlawed and went underground, as dog fights were easier to manage in secret than the larger animals. Warrior Pit Bull came to the United States with British immigrants in the 1800s, and was used both for hunting boar and dogfighting (Hearne, 1991). Though dogfighting became illegal, the practice continued with little impediment, especially in the south. Warrior’s bravery and loyalty led to his becoming the “unofficial representative of American virtues” (Hearne, 1991, p. 186). He “stood for the courage, loyalty, inventiveness, and lack of upper-class pretension associated with the pioneers, the American woodsman, and so on” (p. 184). He was featured in WWI posters, representing the brave and loyal fighting spirit of America. Stubby the pit bull was a decorated war hero whose brave acts included warning his platoon about tear gas. Warrior Pit Bull was beloved as well as a solid family dog—his aggressive tendencies being discerning and geared toward dogs, not humans. Warrior was easy going and tolerant with children, and enjoyed celebrity status in the forms of Petey, the pit bull from “Our Gang,” and Buster Brown’s Tige. Teddy Roosevelt had a pit bull in the White House (Hearne, 1991). Warrior Pit Bull is still celebrated today among pit bull enthusiasts who admire pit bulls’ tenacity, physical strength strong will, and “gameness.” Warrior Pit Bull fans include dogfighters (also called dogmen), breeders, and breed fanciers, some who focus on non-fighting activities such as agility, pulling competition, nose work and rescue. Self-described pit bull steward and proponent of working pit bulls, Diane Jessup (2005), praises pit bull’s “loyalty and power” (p. 10) and describes how “The appeal of the game animal is his cocky, confident, friendly manner, and his ‘never say never’ attitude. His aggression, when called upon, is spectacular, but no less so than his greatness of heart” (p. 11). Healthy Warrior expression manifests in decisive action, clear thinking, awareness of one’s own death and aggressiveness, which is defined as “a stance toward life that rouses, energizes and motivates” (Moore and Gillette, 1990, p. 79). Dogmen look for and foster these aggressive qualities in their fighting pit bulls and put them through rigorous training programs. But by projecting the Warrior onto the dogs, dogmen fail to cultivate healthy aggression in themselves, and instead release the violence of its shadow form. The language of dogfighters is as grand and epic as any talk of war heroes from history and myths. But the lived reality for the fighting pit bulls is filled with physical and psychological torture and death. People who rescue fighting dogs suffer the anguish of witnessing the dogs’ suffering. Those who live in places of endemic dogfighting, like Detroit, suffer fear of dog attacks and violent crime (Kalof & Taylor, 2007), and contend with the horror of finding discarded dead dogs in their neighborhoods (Woods, 2014). Boudreaux’s admiration for pit bulls, the “All American Dog” reveals a longing for certain desirable aggressive qualities, which is connected to patriotic pride. Devotees of fighting dogs express yearning for a form of masculinity lost to modern culture (Freccero, 2011). Entrance into the fighting world has an initiatory character, and leads to mentorship experiences and masculine bonding over shared love of fighting dogs (Weaver 2013a). The Warrior archetype, seeking entrance into this world, has been projected into fighting pit bulls, who suffer hellishly for our lack of conscious engagement with this archetype. 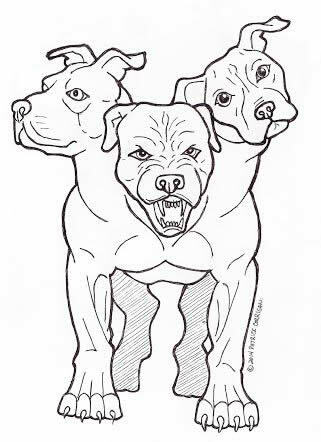 American Cerberus’ second face, Monster Pit Bull, surfaced in the 1980s and was brought about by a convergence of events. Hearne’s theory is that the shift in attitude toward the canine representatives of America’s fighting spirit began with the cultural revulsion at the violence of Vietnam war (1991). Fighting dogs were no longer admired, but were deemed inherently vicious by entities such as the Humane Society of the United States (Hearne, 1991). At the same time, alarmist media reporting on studies of dog bite injuries and (rare) fatalities led to the construction of the theme of the “dangerous dog,” which took a deep and fearful hold in the American imagination (Delise, 2007). Reporting on anti-dogfighting laws converged with the dangerous dog theme, and incited panic and fantastical myths about the type of dogs used in fighting as deviant, supernatural, monstrous dogs, rather than recognition of the dogs as victims of a brutal practice. Pit bulls became associated with gang violence and drug dealing with their growing visibility in urban settings and their use in fighting and for protection. They held the same negative projections put onto people of marginalized racial and economic status, and triggered mainstream fear of the breakdown of society (Delise, 2007; Allen, 2007). Allen states, “The new ‘monster’ pit bull fits in nicely with the thug, another type of ghetto monster” (p. 41). In reaction to the fearful media reporting municipalities across the country enacted breed-specific legislation banning or regulating the ownership of pit bulls, as an attempt to control the perceived threats to mainstream society (Delise, 2007; Allen, 2007). The relatively low numbers of dog bites and fatalities do not justify the breed-based legislation of dogs identified as pit bulls. The National Canine Research Council and the American Veterinary Medical Association provide information about dog bite prevention, and debunk notions of any breed-based tendency to bite and attack (Patronek, et al, 2013). Nevertheless, media coverage of these events continues to be disproportionate and has succeeded in the creation and perpetuation of the image of Monster Pit Bull. He has been imagined as having locking and double jaws, and exponentially more jaw strength than other kinds of dogs. He has been said to have an unpredictable and vicious nature, and to indiscriminately attack other dogs, animals and humans—including family members—without provocation. Regarding women who keep pit bulls, ban supporter Ellen Taft (2011) shares her theory of a “Beauty and the Beast” archetype at work in the relationship: “A pit-bull can be used to give one a false sense of enhanced self-esteem, as a status symbol among women, and to intimidate the rest of society” (“Item 2”, para. 2). Tony Solesky (2010), ban supporter and father of a child who was attacked by a pit bull, protests how “encroachment behaviors of extreme breed fanciers leave one with a sense of being held hostage by another’s choice of pet” (p. 75). For ban supporters, banning pit bulls is a way to provide safety in the community. But in projecting their fears onto pit bulls, they cause unnecessary suffering onto the dogs and the humans who love them, and fail to contribute to real safety in canine-human relations. Pit bull bans also prevent us from dealing with our cultural shadows and race-based inequities. With breed-based legislation, pit bulls carry an extension of the projections put on people of marginalized status, the “Monster” projection that is also put on “ghetto thugs” (Delise, 2007). The Monster projection can be understood as part of a cultural complex (Singer and Kimbles, 2004), defending mainstream America from confrontation with, and responsibility for, shadow aspects of ourselves. The lack of responsibility for and destruction of pit bulls exhibit Foucault’s idea of “dangerous individuals,” those who are inherently deviant and dangerous, who threaten the good in society and need to be removed is (Tarver, 2013). Jungian psychologists Zweig and Abram (1991) emphasize the importance of taking responsibility for evil by those who believe themselves to be working for good: “Historically, great misfortune has resulted when humans have become unintentionally blinded to the full realities of evil and have dispensed miseries much worse than the evil they thought to eradicate” (p. 169). Evil has been unleashed by the reactions to Monster Pit Bull in the name of protecting communities from dangerous dogs. It is the pit bulls themselves who have suffered the most evil, through abuse, abandonment and death. Cerberus’s third face, Angel Pit Bull, counters the imbalance of Monster Pit Bull’s image and its tragic consequences for pit bulls. After years of negative misrepresentation, breed bans, increased population, homelessness, and the resulting abuse, deaths and euthanization of innumerable pit bulls, pit bull rescues and advocacy groups sprung up around the country and promoted new, positive images of the dogs. Organizations like the Humane Society of the United States and American Society for the Prevention of Cruelty to Animals, who once deemed pit bulls dangerous (Hearne, 1991), shifted their stance. They now dispel myths and are some of the larger forces working to prevent cruelty and prosecute dogfighters. Angel Pit Bull is represented by pit bull advocates as sweet, good-natured and loving, a victim of violence and misunderstanding. Angel Pit Bull’s image enhanced exponentially during the Michael Vick dogfighting case, the most publicized dogfighting case in history, and the first case in which the dogs seized from the operation were rescued and rehabilitated instead of euthanized. Although not as obvious, projections of Angel Pit Bull have negative consequences just as do projections of Warrior and Monster. As Weaver (2013a, 2013b) explains, current positive representations of pit bulls contain within them the same cultural anxieties as do the negative projections. Aspects of the growing pit bull advocacy movement, while fortunately breaking down popular negative stereotypes about pit bulls, nevertheless can ignore and/or reinforce underlying root causes of the socioeconomic, racial and cultural problems that put pit bulls into threatened situations to begin with, at times furthering stereotypes in race, class, and culture (Weaver, 2013b). Pit bull rescue often moves pit bulls out of marginalized community spaces and into middle class homes, where they go through a kind of redemption process. They are “No longer partnered with ‘thugs’” and come to “participate in families in ways that connect them to a tacit, normalized whiteness” (Weaver, 2013a, p. 697). In this way, rescued pit bulls unwittingly contribute to ongoing race and class division, which correspond to internal splitting off of autonomous shadow parts of the collective unconscious. We seek salvation in personal encounters, personal relations, personal solutions…Our cult worships or propitiates actual people — the family, the beloved, the circle of encounters — while ignoring the persons of the psyche who compose the soul and upon whom the soul depends” (p. 47). We cannot saddle rescued pit bulls with the task of saving our souls. We can, however, understand that redemption narratives in pit bull rescue offer clues about our souls’ unmet needs. Vicki Hearne (1991) wrote: “We will learn to save our dogs by saving our own souls” (p. 294). As mentioned above, the soul requires nourishment and renewal in the underworld of psyche. In the underworld we fall apart in order to integrate lost or rejected parts of our selves and by extension, our communities and world. American Cerberus guards the threshold of our underworld and confronts us with the projections that cause harm to dogs, perpetuate social inequities, and prevent our soul’s growth. If we withdraw the projections of Warrior, Monster and Angel and work through these complexes, we—and the dogs too—can become more whole. Pit bulls need no longer suffer Hades for us. Allen, T. (2007). Petey and Chato: The pitbull’s transition from mainstream to marginalized masculinity. (Doctoral dissertation). Retrieved from ProQuest. (UMI 3278347). Foster, K. (2012). I’m a good dog: Pit bulls, America’s most beautiful (and misunderstood) pet. New York, NY: Viking Studio. Gorant, J. (2010). The lost dogs: Michael Vick’s dogs and their tale of rescue and redemption. New York, NY: Gotham Books. Hearne, V. (1991). Bandit: Dossier of a dangerous dog. Pleasantville, NY: The Akadine Press Inc.
Jacobi, J. (1959). Complex, archetype, symbol in the psychology of C.G. Jung. New York, NY: Princeton University Press. Jessup, D. (2005). The working pit bull. Neptune City, NJ: TFH Publications, Inc.
Kalof, L., Taylor, C. (2007). The discourse of dogfighting. Humanity and Society. Vol. 31. November: 319-333. Moore, R., & Gillette, D. (1990). King, warrior, magician, lover: Rediscovering the archetypes of the mature masculine. New York, NY: HarperCollins Publishers. Singer, T., & Kimbles, S.L. (2004). The cultural complex: Contemporary Jungian perspectives on psyche and society. New York, NY: Routledge. Strouse, K., with Dog Angel (2009). Badd newz: The untold story of the Michael Vick dog fighting case. Dog Fighting Investigation Publication, LLC. Vick, M. (2012). Finally free: An autobiography. Brentwood, TN: Worthy Publishing. Weaver, H. (2013a). “Becoming in kind”: Race, class, gender, and nation in cultures of dog rescue and dogfighting. American Quarterly 65(3), 689-709. The Johns Hopkins University Press. Retrieved September 27, 2013, from Project MUSE database. Weaver, H. (2013b). Inhuman kindness: Queer kinships in pit bull advocacy. (Under review at GLC. September, 2013.) Received in personal email by author. Zweig, C., & Adams, J. (1991). Meeting the shadow: The hidden power of the dark side of human nature. Los Angeles, CA: Jeremy P. Tarcher, Inc.
Elizabeth Selena Zinda is currently working on her dissertation at Pacific Graduate Institute in the M.A./Ph.D track in Depth Psychology, with a focus on community psychology, liberation psychology and ecopsychology. Her topic, pit bulls and psyche in the U.S., arises out of her passion for healing relationships among humans, and between humans and other-than-humans. Elizabeth is a massage therapist and ordained minister. She lives in Seattle with her wife and three dogs.